The Rotary Donor Wall is shaped like a giant map of Iowa. Its patriotic colors are red, white and blue. It’s got stars and stripes like an American flag. And there are 600 replica baseballs for your name to be inscribed for all eternity. Prospect Meadows has begun a radio advertising campaign to continue selling spots on the wall to individuals, families and companies who would like to become part of history by having their names placed on the new iconic structure. Tens of thousands of people will be coming to Prospect Meadows each year and one of the first things they’ll see when they walk through the gate is the eye-catching Donor Wall. The fundraising effort is being held in partnership with the Metro Area Rotary Clubs, whose motto is Service Above Self. There is a huge Prospect Meadows logo on the Donor Wall, along with big letters that say Linn County, Iowa, USA. You can put your family names on the wall, you can put your business or company on the wall, or you can dedicate one of the baseballs or stars to someone else you hold dear. You can request a red, white or blue ball. All participants will get a three-line inscription, with 12 characters on the first line, 13 characters on the second line and 12 characters on the third line. Prospect Meadows has a 95-year lease with Linn County for the complex, with an estimated 60,000 people to visit the site each year. The Rotary Donor Wall, with your name inscribed, could be seen by hundreds of thousands of people as time goes by. The Donor Wall should be an attractive setting for individuals and teams who want to pose for pictures, including championship teams after they’ve won a big tournament. Approximately 400 of the 600 baseballs on the Donor Wall are still available for purchase, along with a limited number of stars. 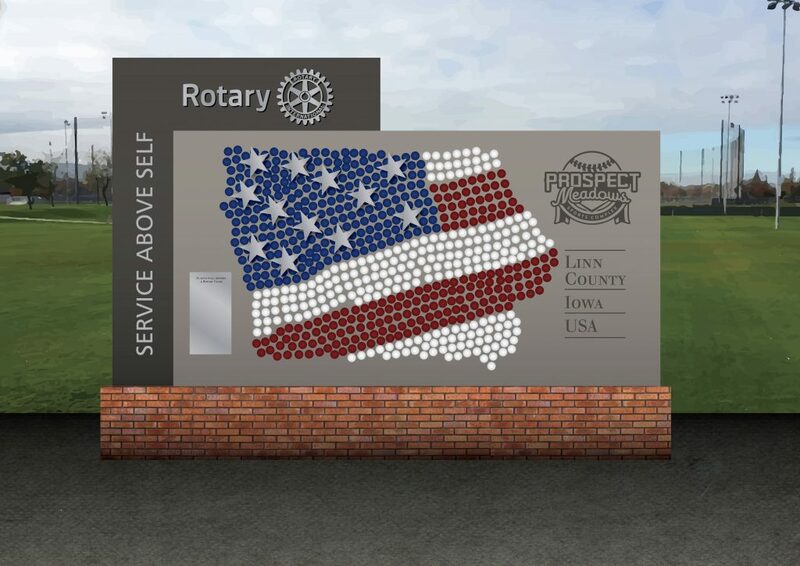 You can call Prospect Meadows at 319-393-1684 to learn more about the Rotary Donor Wall and purchase a baseball. Contact Jack Roeder (Jack@ProspectMeadows.com) to check on star availability. A pledge check must be made in full, payable to Prospect Meadows at 1890 County Home Road, Marion, Iowa, 52302. Pledges also can be made online in two installments at ProspectMeadows.com/rotary-wall. The Opening Ceremony for Prospect Meadows is scheduled for this spring. The first phase of the new complex includes eight regulation baseball fields and the Miracle Field for people with special needs. The second phase of the project is scheduled for completion in 2023 and will include eight youth baseball and softball fields.